VLP flexible partitions was founded in 1982 as 'Van Leeuwen Plastics B.V.' and emerged from 'Firma Van Leeuwen Grondstomen' which was founded in 1965 and specialized in the rental and sale of soil steaming materials to growers. With this soil steaming materials greenhouse soils were disinfected before the new crop was planted. In the early 80's, the use of Methyl Bromide (disinfecting gas) as an alternative soil disinfectant was banned in horticulture. Due to the ban on Methyl Bromide 'Van Leeuwen Grondstomen' grew rapidly. This opened the path for Wim van Leeuwen sr. and Wim van Leeuwen jr. to start the production of steam sheets. This happened in a workshop equipped with high-frequency welding equipment, and that was the start of 'Van Leeuwen Plastics'. The product range was soon expanded with tarpaulins, boat and trailer hoods, pond and pool linings etc. Soon followed by sliding walls, strip curtains and swing doors. During this period VLP sold only to growers, greenhouse building companies and horticultural suppliers. More and more products were added to the program, such as industrial curtains. As the name implies, a product which was sold mainly to the industry and the garage sector. Due to the demand from the market for automatic doors, VLP started producing door operators for use on sliding doors. Shortly followed by aluminum sliding doors, vertical sliding walls, vertical sliding panel shutters and High-speed doors. To reduce noise during testing exhaust gases and 4-gas testing in the garage sector, VLP developed a patented soundproof curtain. Cold storage temperature insulating curtains were developed as a flexible alternative for solid insulated walls. As an industrial workplace separation the rolling curtains and folding curtains were added to the program. For use in refrigerated distributing trucks a special rolling door door has been developed that reduced the outflow of cold drastically. 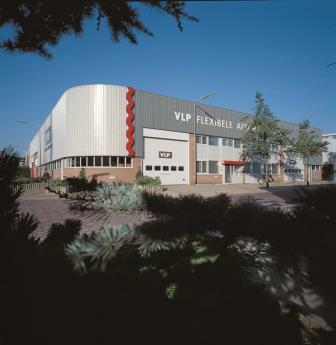 Business was still good so VLP moved on March 16, 1998 to a new location at the Industriestraat in Naaldwijk. Currently VLP flexible partitions supplies to various market segments in agriculture and horticulture, bulbs sector, coach and garage sector, production industry (concrete, steel, wood, plastic and paper), printing, storage and transportation, food processing, construction, petrochemicals, air bases and shipyards. We export to many countries in Europe and North America and Canada.